Leyton Orient beat Crawley for their second home league win of the season to climb up to 20th in League One. Dean Cox put the hosts ahead with a well-struck 20-yard free-kick, before Jimmy Smith scrambled in an equaliser. Chris Dagnall's header restored Orient's lead and David Mooney made it 3-1 after goalkeeper Brian Jensen parried Dagnall's effort. 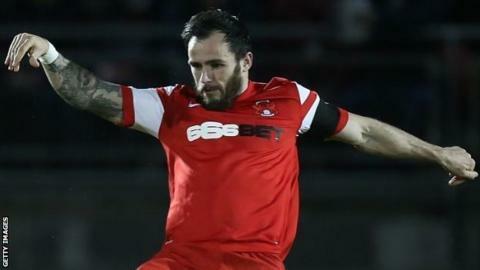 Dagnall scored his second and Orient's fourth in injury time, finishing off Bradley Pritchard's cross. "We did everything we could with the players we had available and, particularly in the first half, I was happy with the shape in the team and the way we were using the system. Everything was pretty fluid and they had two opportunities on our goal and they scored with both, that was the frustrating thing. "Brian Jensen played well today. He's been out in the cold and he came back into the side and he did very well and made some crucial saves. "We are looking for more up top and we only had six subs today and we're down the the bare bones, but we have to battle on when we face Colchester on Sunday." Match ends, Leyton Orient 4, Crawley Town 1. Second Half ends, Leyton Orient 4, Crawley Town 1. Goal! Leyton Orient 4, Crawley Town 1. Chris Dagnall (Leyton Orient) right footed shot from very close range to the bottom left corner. Assisted by Bradley Pritchard. Attempt blocked. David Mooney (Leyton Orient) right footed shot from the centre of the box is blocked. Foul by Shane Lowry (Leyton Orient). Matt Harrold (Crawley Town) wins a free kick in the defensive half. Foul by Chris Dagnall (Leyton Orient). Marvin Elliott (Crawley Town) wins a free kick in the attacking half. Attempt missed. Gavin Tomlin (Crawley Town) right footed shot from the right side of the box is close, but misses to the left. Goal! Leyton Orient 3, Crawley Town 1. David Mooney (Leyton Orient) left footed shot from the centre of the box to the centre of the goal. Assisted by Chris Dagnall. Attempt saved. David Mooney (Leyton Orient) right footed shot from the centre of the box is saved in the centre of the goal. David Mooney (Leyton Orient) wins a free kick in the attacking half. Foul by Emmett O'Connor (Crawley Town). Substitution, Crawley Town. Emmett O'Connor replaces Dean Leacock because of an injury. Attempt missed. Ryan Dickson (Crawley Town) header from the centre of the box misses to the right following a corner. Corner, Crawley Town. Conceded by Shane Lowry. Lewis Young (Crawley Town) wins a free kick in the attacking half. Attempt saved. Chris Dagnall (Leyton Orient) left footed shot from the centre of the box is saved in the centre of the goal. Corner, Crawley Town. Conceded by Elliot Omozusi. Substitution, Crawley Town. Lewis Young replaces Bobson Bawling. Attempt saved. Josh Wright (Leyton Orient) right footed shot from outside the box is saved in the top centre of the goal. Foul by Josh Wright (Leyton Orient). Substitution, Leyton Orient. Gary Woods replaces Adam Legzdins because of an injury. Foul by David Mooney (Leyton Orient). Marvin Elliott (Crawley Town) wins a free kick in the defensive half. Attempt missed. Josh Wright (Leyton Orient) right footed shot from outside the box is close, but misses to the left. Attempt blocked. Jobi McAnuff (Leyton Orient) right footed shot from outside the box is blocked. Corner, Leyton Orient. Conceded by Bobson Bawling. Substitution, Crawley Town. Gavin Tomlin replaces Shaun Miller. Substitution, Leyton Orient. Bradley Pritchard replaces Dean Cox. Romain Vincelot (Leyton Orient) is shown the yellow card. Dean Cox (Leyton Orient) wins a free kick in the defensive half. Foul by Shaun Miller (Crawley Town). Matt Harrold (Crawley Town) is shown the yellow card. Shane Lowry (Leyton Orient) wins a free kick in the attacking half. Foul by Matt Harrold (Crawley Town). Attempt missed. Dean Cox (Leyton Orient) right footed shot from outside the box is just a bit too high.